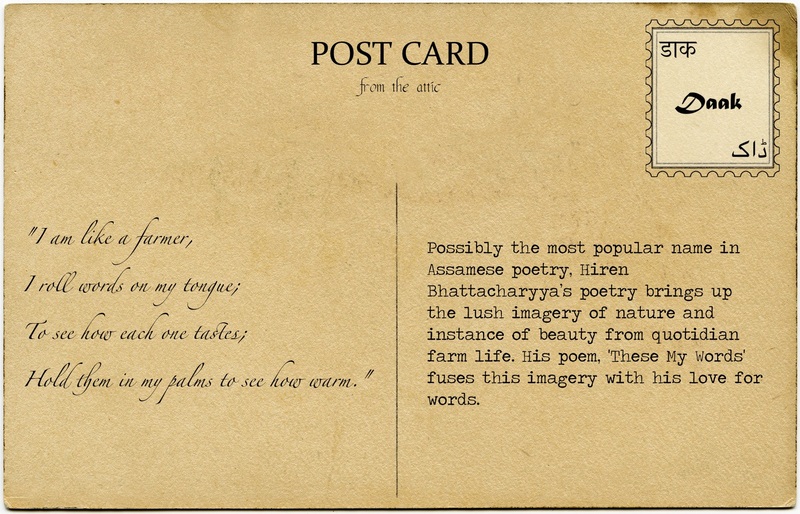 Possibly the most popular name in Assamese poetry, Hiren Bhattacharyya’s poetry brings up the lush imagery of nature; of paddy fields, of waves of green, of ripples in the air and of gushing rains. He had a long career as a writer and editor of many periodicals in which his poems were much awaited. The Internet tells us that he added the word shosyoghran, a beautiful word for the smell of harvest, to the Assamese dictionary. Reading his beautiful words, even if translated, shows how apt this happening was. The orgiastic frenzy of a brutal sky. Breaks the lull of an inky sky. There’s a season for every poem. His imagery of nature is soothing in its invocation of colours and smells, and the emotions and associations with them. However, a poem that particularly touched us was one that talks of words in the hands of a young poet. Imagery of nature and farming intact, he fuses this beautifully with his love for words. The intimate warmth of time. I have no inventions of my own. Hold them in my palms to see how warm. You can read more of his poetry here and learn more about his life here.